Sun Peaks skiing and snowboarding at Canada’s second largest ski resort is considered to be the best Sun Peaks winter activity by most visitors. But there are also many other Sun Peaks winter activities for skiers and non-skiers to enjoy there, as well as free or low-cost activities. Lifts start turning for the 2018/19 ski season on November 17th, 2018. Discounted lift tickets and rental packages are available, as are Sun Peaks vacation rentals which are booking up fast. With three mountains (Tod, Sundance and Morrisey), all conveniently leading down to the quaint, ski-through European-style village, Sun Peaks offers trails to keep everyone happy over their 137 (and still growing) trails spread out over 4,270 acres of terrain with 13 lifts. There may not be the extreme cliffs and steeps that some other nearby resorts offer, but there is a maximum 882 meter/2,894 feet of vertical, two alpine bowls, 17 gladed areas and a cool 10 acre terrain park for skiers and boarders. 4 high speed quads, 2 regular quads, 1 triple and 6 surface lifts can easily get up to 12,000 riders/hour up one of the three mountains, where you quite often will have some runs to yourself. December 2018 included the introduction of the newest quad lift, currently referred to as the Orient. There is also some fantastic off-piste, back-country-like but now in bounds, gladed skiing in the Gil's ski area for intermediate to expert skiers to explore and enjoy. Professionally certified Canadian Ski Guides hold daily Introduction to Back-country ski camps in the Gil's area at Sun Peaks. While this is not a certification type of course, it is highly recommended as students learn the basics of avalanche gear, partner rescue, reading the terrain, and snow science. Click to learn more about Gil's and back-country courses. Click to save up to 40% on Snowboard, Nordic or Alpine ski passes and /or equipment rentals. 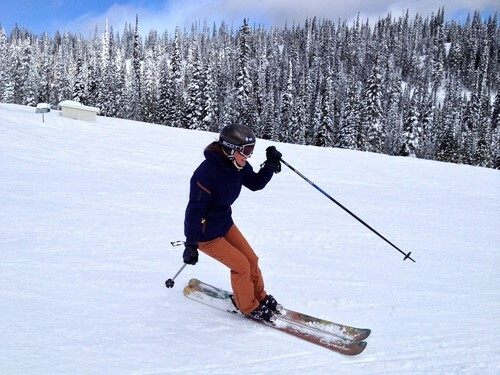 Click here for Best Sun Peaks ski equipment rental options. Book Best Sun Peaks ski-in/ski-out vacation rentals direct with the owners and save an average of 10%, all with great ski-in/ski-out access. Line-ups are virtually non-existent, the lifties and groomers all do a fantastic job, there are many bluebird days with over 2,000 hours of sunshine each year, and Sun Peaks is consistently ranked as one of the Best Family Friendly Ski Resorts in North America. 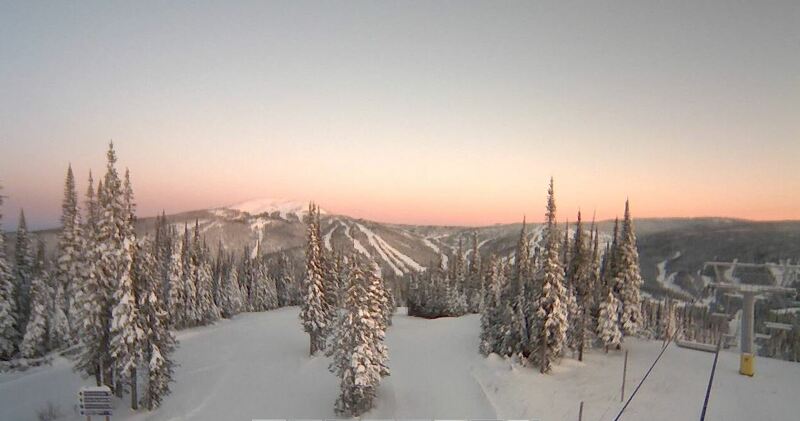 Ski/board season at Sun Peaks typically runs from the third weekend in November until the end of the second week of April, and there is typically over 6 meters or 237 inches of famous, light, fluffy, dry champagne powder to enjoy. It frequently falls overnight so you will want to rise early each day and have a peek. There are excellent instructors/lessons for skiers and boarders of virtually any age or ability, from tots and beginners to experts who want to learn snow safety and survival skills or learn from local experts where the best Sun Peaks ski runs and powder stashes are. Excellent childcare services are available at the base of the mountain, and Sun Peaks snow-limos are even available for those who would love to feel the thrill and excitement of skiing but are unable to for any number of reasons. Sun Peaks is an excellent family/intermediate resort, with 10% of the runs being green, 58% blue, and 32% black or double-black diamond. 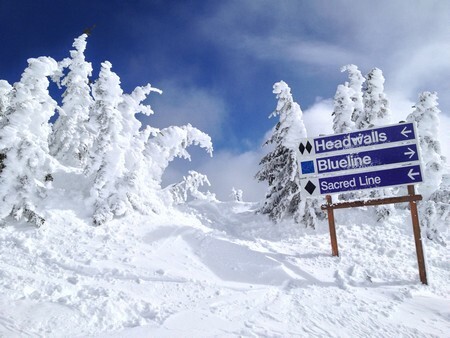 The longest cruiser is 5 Mile, and yes it is 5 miles long, home of the popular Sun Peaks Evening Fondue and Descent nights, and all three mountains have a mix of runs that would suit any skier. Some locals (who want non-local skiers to stay away from their Burf turf with all the best Sun Peaks powder) will suggest visitors head to the village and do a few warm-up runs on the groomed Sundance Mountain trails first, followed by some great runs and wide open bowls up in the Crystal and Top of the World area of Tod Mountain. Head to the village for some lunch, and then head up and/or over to Morrisey where the decorated pine trees and afternoon sunshine on typically 'still-fresh snow' await skiers and boarders. Finish off a fantastic day of skiing by either heading back to the village for some apres-ski fun, or ski out to your wonderful Sun Peaks accommodation and hop into the waiting hot tub, or book an in-suite massage. Enjoy a leisurely stroll back to the village after dinner and enjoy a wonderful horse drawn sleigh ride around the village. Many excellent ski lesson options for tots through to experts with fantastic instructors at all levels. The 2015/16 season included a new training area for tots, and a special camp tailored to keep teens interested and improving. The Sun Peaks instructors are always receiving kudos for the fantastic job they do with the students of all ages and abilities. - All Mountain Skills Camp which focuses on off-piste safety and awareness of mountain hazards, including terrain assessment, hazard analysis, overnight survival, as well as companion rescue with transceiver, probe, and shovel techniques. Our kids both thought this course was AWESOME! - Beyond the Groomers Camp allows you to explore over 500 acres of expanded terrain (with steeps, glades, moguls, and exceptional powder skiing) in this guided ski improvement camp with their top professional instructor. - Helicat Warm Up Camp which allows skiers to properly warm-up and fine tune their powder skiing technique in the legendary Gil's terrain while developing the necessary backcountry skills prior to enjoying a spectacular nearby Helicopter or Cat skiing vacation. Learn or be reminded about avalanche awareness, companion rescue, tree wells and backcountry hazard recognition with this wonderful new course. To learn more about these and other Sun Peaks Resort guided tours and camps, contact the Sun Peaks Sports School or simply complete and submit the form below and a sports school expert will be in touch. 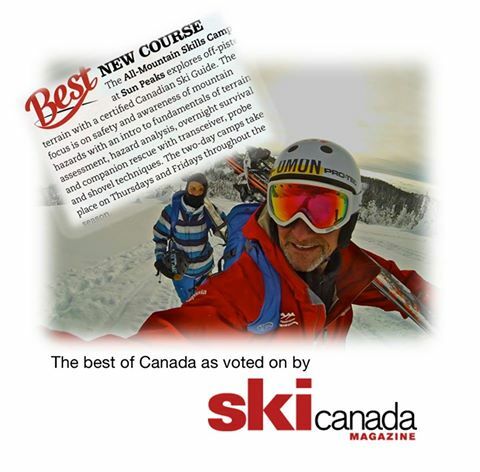 If you prefer to have Bodie as your instructor/guide if he is available, please specify in your comments so the ski school knows to check his availability. Olympic Champion, Canadian Senator, and Director of Skiing, Nancy Greene Raine makes her winter home at Sun Peaks and enjoys skiing with resort guests on weekends and holidays whenever possible. Generally tours depart most Saturdays and Sundays at 1:00pm from the top of the Sunburst Express chairlift. Signs indicating if Nancy is skiing that day are posted at the bottom and top of the Sunburst and Sundance chairs and everyone is welcome, no matter what ability level you are! Sun Peaks Snow Hosts offer very popular and FREE daily tours of the mountains for virtually all skier levels, departing from an area between the day lodge and the Sunburst Express daily at around 9:15 am and 1:00 pm – look for their trademark bright orange jackets about 10 minutes before scheduled departure times. While even most experts can`t try all the 133+ runs in one trip, you can explore and enjoy the diverse and vast skiable terrain by picking up a Sun Peaks Three Mountain Tour trail map at Guest Services. The suggested route will cover almost 27 kilometers and 2,735 vertical metres, and takes you on some of the best runs on all three mountains. Enjoy over 34 kilometers of scenic, well-groomed and track-set cross-country ski trails right from the village and most accommodation. Better yet, use your lift pass to ride the Morrisey Express Chairlift for access to wonderful backcountry terrain and scenic mountain views off the Holy Cow trail. You can even bring your dog along on the Sun Peaks Skiing pet-friendly route to the McGillivray Lake Outpost warming hut. The Sun Peaks Evening Fondue and Torchlight Descent down the 5 Mile run is another truly unique Sun Peaks skiing experience that we totally enjoyed and recommend to others. 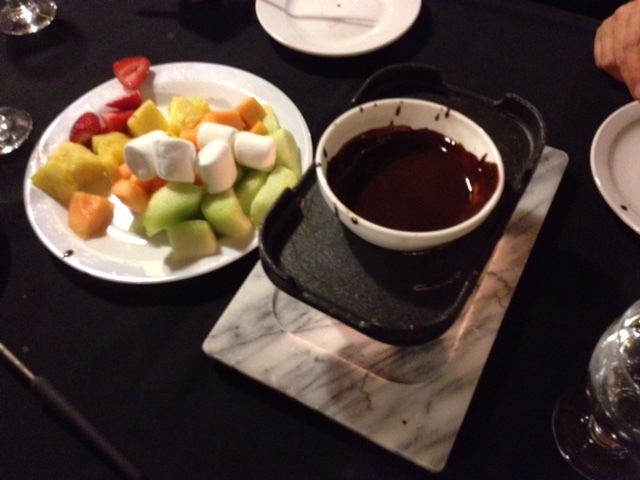 Great food, times and evening skiing by torchlight. You need to be quite comfortable on green runs and please remember to remove your ski goggles at night!! Tons of fun enjoying Sun Peaks Skiing at night!! There are so many fun-filled winter activities, for free or to purchase. Please see our Best Sun Peaks winter activities page, and let us know what your favorite trail or activity was. 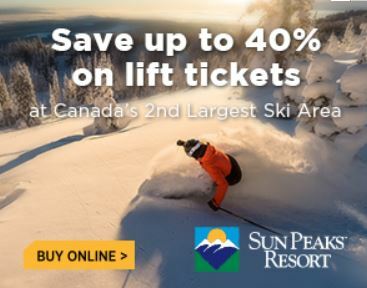 For Best Sun Peaks skiing and snowboarding lift pass prices - buy lift tickets in advance and online to save up to 40% off the walk up pass price.